There is currently no country in the world where men and women are truly treated equally. At the current rate of progress, according to indicators from the World Economic Forum, it will take an estimated 217 years to achieve full gender parity. We cannot afford to wait that long, writes Marie-Louise Coleiro Preca. Marie-Louise Coleiro Preca is the president of Malta. On October 11, we will mark the International Day of the Girl by acknowledging the value and contribution being made by some 1.1 billion girls, who form part of the world’s population. This generation of girls is growing up in a time of unprecedented social, political, economic and environmental transformation. Never before have we required such strong leadership and innovation, which incorporates the participation of people of all ages and genders. In order to meet the global challenges being faced by our world, I believe that we must, first and foremost, remove the obstacles that are currently impeding our progress towards achieving full gender equity and equality. Achieving real opportunities for people of all genders is at the heart of the United Nations’ Agenda 2030, and its Sustainable Development Goals. In particular, SDG Number 5 pledges the international community to achieve gender equality and women’s empowerment, within our lifetimes. However, there is currently no country in the world where men and women are truly treated equally. At the current rate of progress, according to indicators from the World Economic Forum, it will take an estimated 217 years to achieve full gender parity. We cannot afford to wait that long. I am certain that in order to create a sustainable and long-term change, we must actively include the voices and experiences of our young girls. They are essential stakeholders in our journey towards positive change. We must set our girls on a trajectory in which they are given the same opportunities to thrive and reach their full potential, just like our boys. Girls must be assured of equitable access to opportunities in all facets of their lives, from education through to employment. When we respect the full dignity and well-being of women and girls, and the value of their contributions, then we can make a real difference in our communities and our society. For this reason, we must continue to promote active processes of child participation, which recognise children as social agents in their own right. We must raise our daughters to think of themselves as potential leaders and innovative thinkers, with a worthwhile contribution to make to our society. There is an urgent need to widen the opportunities open for children and lift up our young girls in particular, by empowering them to become women who lead. It is for this reason that I am a proud patron for the #Girl2Leader campaign, launched by the Women Political Leaders Global Forum. The #Girl2Leader campaign seeks to overcome dangerous forms of gender stereotyping, and create an environment which encourages and supports young women to consider the possibility of a career in politics and leadership. 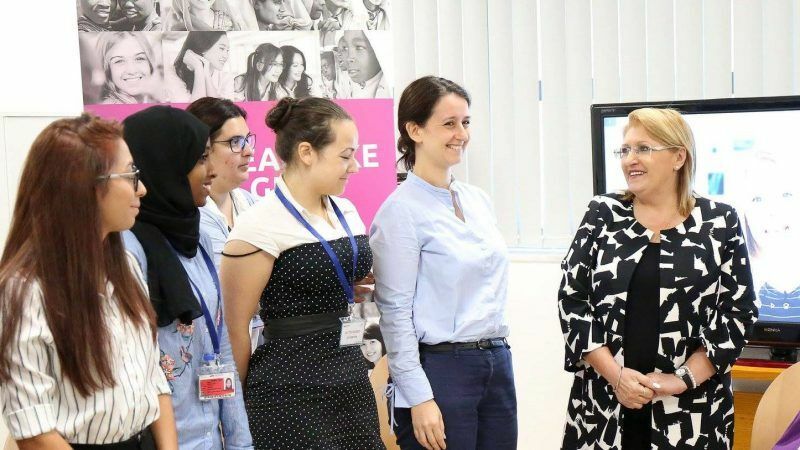 On Thursday, which is the International Day of the Girl, the #Girl2Leader campaign will connect more than 1,500 girls from over 20 countries with women politicians. Different campaign events will take place simultaneously in Albania, Bolivia, Canada, Guinea, Ireland, Kenya, Malaysia, Malta, Monaco, Poland, Romania, Rwanda, Serbia, Ukraine, the United Kingdom, the USA and at the European Parliament in Brussels. If we hope to overcome the many challenges facing our world today, while also promoting positive peace, holistic well-being and social justice, I am certain that we cannot afford to leave half of our human family behind. Our world needs inspiring role models and strong strategies for shared leadership. The world needs the precious participation of all our women and girls, alongside men and boys. In this way, we shall be creating the kind of future that we will be proud to hand down to future generations. This article has been adapted from a version published by the Times of Malta.